At what point do you think I regretted buying this particular item for Quinn? Answer: It's a trick question! I regretted it even before I paid for the damn thing at the party store. Actual quote from Quinn: "This way everyone can hear from me." You are bonkers. Also it's like 80 degrees today and I see Quinn is wearing his winter coat. Hahahaha. I laugh because I can't hear it. LOL It must have been a temporary lapse of sanity! God! You're like the people who give whistles in goody bags. What were you thinking? Of course, we ALL want to hear from Quinn! ;) Don't worry, maybe he'll "lose" it after a few days! Good God, woman! 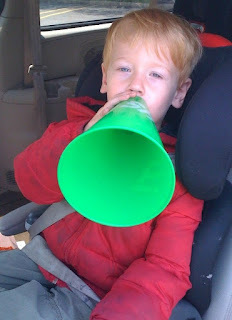 What drugs were you taking (or, what meds did you *forget* to take) that made you think small boy+giant megaphone= wise decision? Oh my gosh. I thought only people that didn't like you gave you things like that for your kids! I bought my kids whistles. Because I'm an idiot. Well, he doesn't have a blog! He's got to get his message across somehow! Dude! You bought one of those?!? I have some stashed in my closet I would have given you for free. LMK if you need to do a drive by to pick up some for Jack and Sam. I also have ear plugs if you need those too! Yet you still bought it... I think I did something like that once with a musical hammer. Now see, I'd have to make that thing disappear, and quick! Is that him making noise outside at this hour?